Yuck! Ink! On your hands! Your clothes! Noooooo! Chill out. We can fix this. 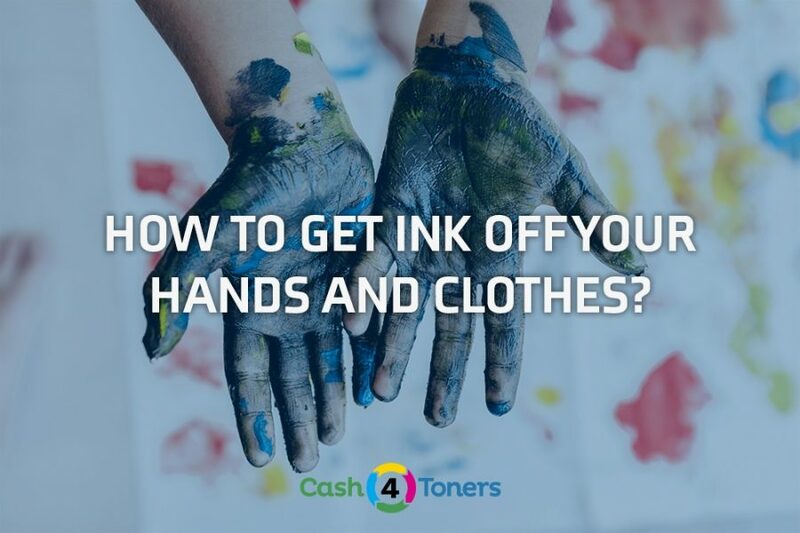 Follow the steps below to get printer ink and toner off your hands and clothes. The longer ink sits and soaks into your skin or clothes, the more difficult it is to remove. You’re going to want to blot away the excess ink immediately and rinse with cold water. Dreaded inky fingers are inevitable. HP claims washing with gritty soap should remove its printer ink from your skin, but sometimes you need other, more intensive methods. The ammonia in glass cleaners is good at dissolving printer ink. Spray some Windex on your inky fingers and let it sit for moment. Then rub your fingers together. Then wash your hands with soap and water. Hair spray can also remove ink from skin. Spray your inky fingers with hairspray and let it sit for moment. Rub your fingers together and wash with soap and water. Baby oil can also break up ink stains on the skin. Rub some into the stain to loosen the ink, then wash your hands with soap and water. Still stained? You’ve got stubborn ink. No worries, we’ve got heavy duty cleaners to get that ink out. Lava soap and GoJo degreaser will often remove tough stains because it contains grit and solvents which abrade away ink stains on the skin. You could also try tea tree oil or nail polish remover, but both of those options are rather stinky. Treat the stain immediately. Ink stains are very difficult to remove once they’ve set in. Check the laundry tag. If the ink-stained garment is washable, proceed to step three. If not, you’re heading to the dry cleaner. Saturate a cotton ball or pad with denatured alcohol and thoroughly moisten the stain. As the cotton picks up the ink, repeat step three until the cotton has absorbed all the ink and comes away clean. . Flush the stain with denatured alcohol and allow it to dry completely. Alcohol may not remove all water-based stains. If this is the case, wash the garment in lukewarm soapy water. If any ink remains on the garment, rub the stain with salt and let it sit in a bowl of milk overnight. Milk? Yeah, milk. Ink stains can be lifted out in the wash if you presoak them in a mixture of milk and lemon juice. Rinse the stain with cold water and launder as usual. Cold water is your best buddy when it comes to ink stain removal from fabrics. Warm or hot water will “set” the color into the fabric. Oh, and don’t mix ammonia and bleach…you’ll create a toxic gas! HP suggest you immediately risen the stained clothes with cold water. If ink from an HP Inkjet print cartridge spills on white fabric, use chlorine bleach and cold water to remove the stain. If your clothing tag forbids you using bleach — for set-in stains only — use a pre-treatment solution consisting of two tablespoons of liquid detergent, three tablespoons of white vinegar, and one quart warm water. If HP ink spills on a colored garment, use sudsy ammonia—a dilute mixture of detergent and ammonia—and cold water. Act quickly and test on a hidden area first. Why is that ink cartridge leaking anyway? Who knows? You just want to get your hands and clothes clean. 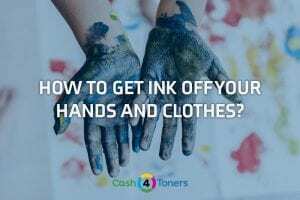 Using the methods outlined above, you can successfully accomplish both tasks the next time you encounter spilled ink. Just remember. Bleach and ammonia don’t mix! Toxic! Ultimately, you should kick that inkjet to the curb and treat yourself to a laser printer. It’ll last longer, run cheaper, and won’t leave you with dreaded ink fingers. Plus, you can sell off your unused, unexpired ink here!